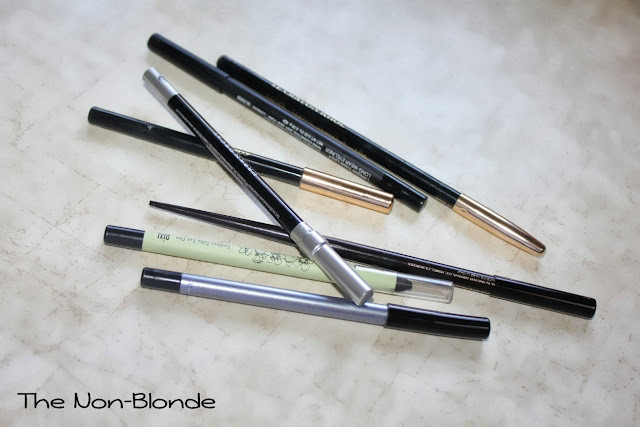 A black eyeliner pencil was the first makeup item my friends and I wore on a regular basis. It was cheap, had a major impact, and required little skill. It was the eighties, I was a Cure fan; need I say more? Urban Decay 24/7 in Zero. This one is a modern classic. soft, pliable and blacker than black. Longevity is medium compared to other long-lasting pencils, but the intensity makes up for it, and the creamy texture acts as a base for many a smoky eye. $19 at Sephora, Ulta, and urbandecay.com. NARS Larger Than Life in Via Veneto- This one stays on forever and a day. It's a workhorse if there ever was one. $24 at the counters, Sephora, and narscosmetics.com. Hourglass Film Noir Kohl Pencil in Eclipse Black- The most elegant of the bunch. It's too soft for summer, but a favorite for a dramatic winter look. $28 at the counters and Sephora. Pixi Endless Silky Eye Pen in BlackNoir. I'm a huge fan of Pixi pencils and have one in each color. Intense and long lasting, NoirBlack might not be the most interesting thing Pixi has to offer, but it works beautifully and can be found at Target when you have an eyeliner emergency. $15 at Target and pixibeauty.com. Lancome Le Crayon Khol in Black Ebony. A classic. I've had one in my stash since my late teens and always replenished. This is a true kohl pencil, made for the waterline and for good smudging, even though it's dedfinitely not as black as the modern competitors. $26 at the counters, Sephora, Ulta, and lancome.com. Armani Eyes To Kill Waterproof Liner #1. It used to be a limited edition item that came and went with different seasonal collection. The pencil always sold out withing days of the (re)release, making people hoard and hoard (and sell on eBay at an unbelievable markup). Now part of the Eyes To Kill range. $28 at the counters and giorgioarmanibeauty-usa.com. YSL Waterproof Eye Pencil #1 Black Ink. 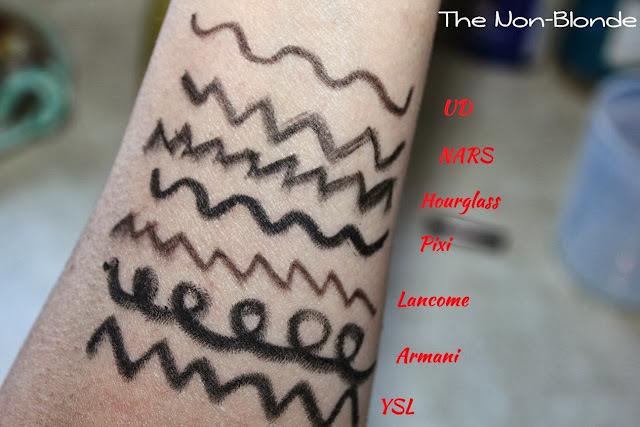 YSL Black Ink used to be the alternative to the limited edition Armani pencils. Now it's actually $2 more expensive but still as fabulous, except that they get depleted far too quickly. $30 at the counters, Sephora, and yslbeautyus.com. The pencils from NARS and Hourglass were press samples. I love Nars Via Veneto too. But I find Urban Decay Perversion to be the best black eyeliner pencil EVER. I have never tried zero, admittedly. The Armani eye pencils became part of the permanent range?! OMG. I own one in dark brown and it's just amazing. One of the few high-end pencils actually worth every penny. I love this post! I think I've tried most of the ones you mentioned. My problem is actually finding an eyeliner with a good balance of blendability (aka not as buttery soft as Pixi) with long lasting power (like NARS) without it being waterproof. And for black, it has to be really black. I haven't found one yet.. but the closest is perhaps Elizabeth Arden powder pencil (less black than the GA, not as long lasting, obviously, but texture-wise is what I'm looking for). 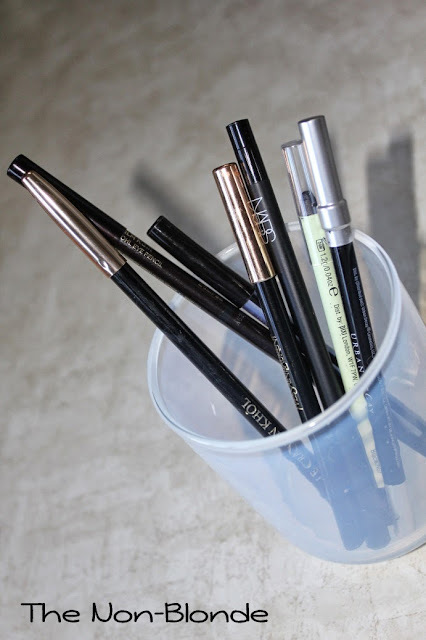 The Lancome kohl has been been in heavy use for years, it was my very first black eyeliner, that and their black lapis liners were my go-tos in college. I have yet to find Pixi or Poppy King at Target, I am seriously bummed out about that! Wow - that pixi pencil looks awesome - thanks for these reviews! I'll have to check out the Nars one as well. I have the Urban Decay pencil but I find that it's not long lasting enough for me. Elizabeth Arden powder pencil is my fav. I tried the Pixi one once and it smudged all over on me.